Two parts of mold are tied together. Rubber and coir mold is tied and kept for molding. 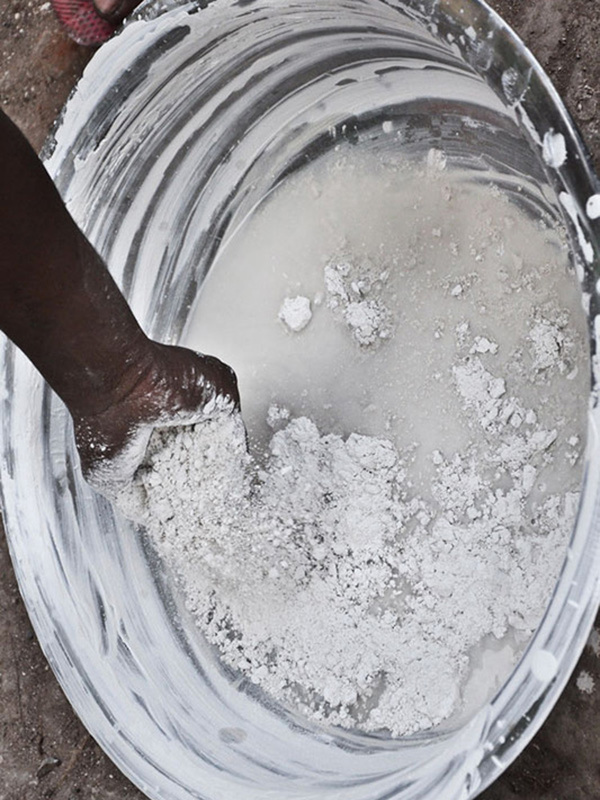 POP powder is mixed with water to make paste. The POP paste is poured into the mold. The excess pop in the mold is removed. The paste is allowed to set in the mold for 30 mins. 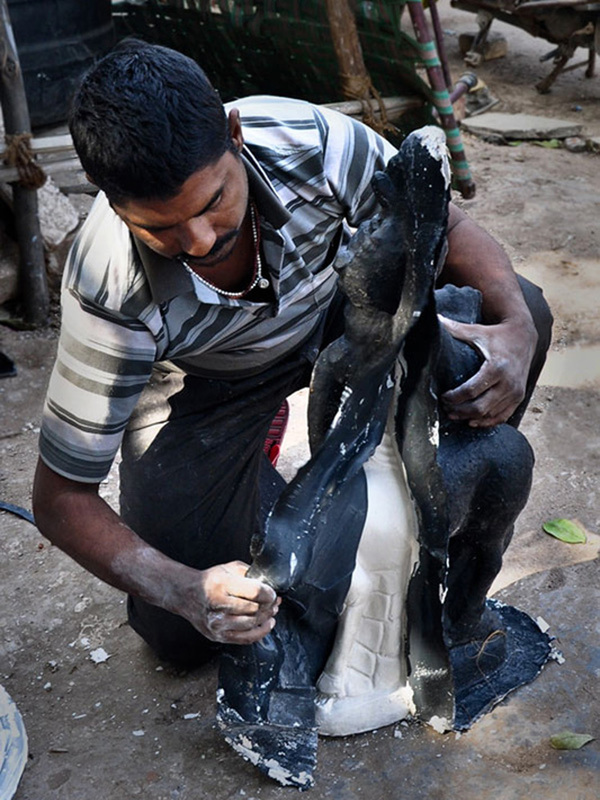 After drying the rubber mold is removed to reveal the idol. 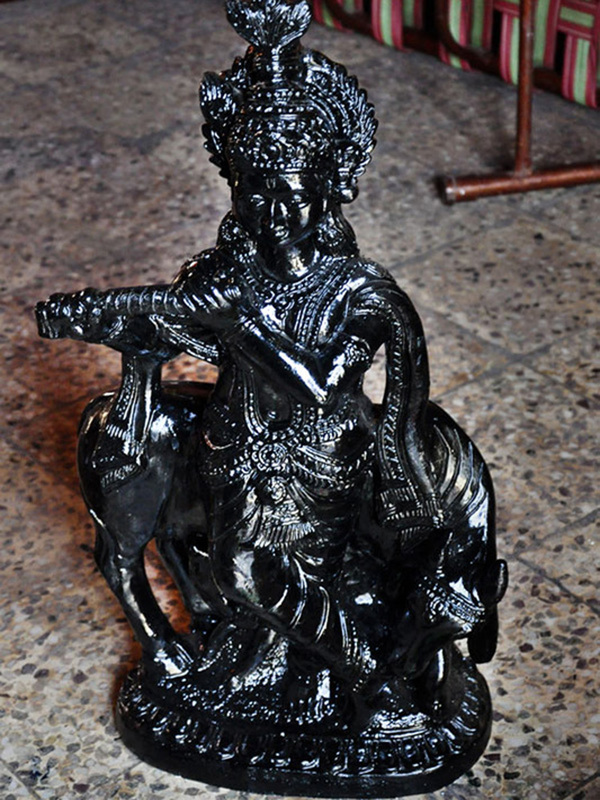 Black color, which is a mixture (varnish, black water color and kerosene) is coated to the Idol of lord Krishna. 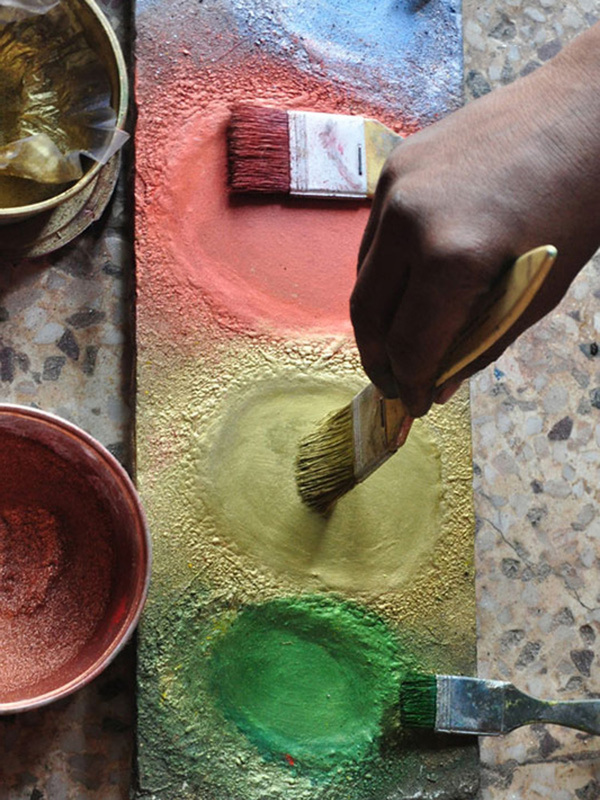 Color powder, Varnish and kerosene are mixed in the ratio of 1:3 and applied on the product. Yellow color is applied on Sarong. Light pink color is used as a cheek gloss to the Idol. 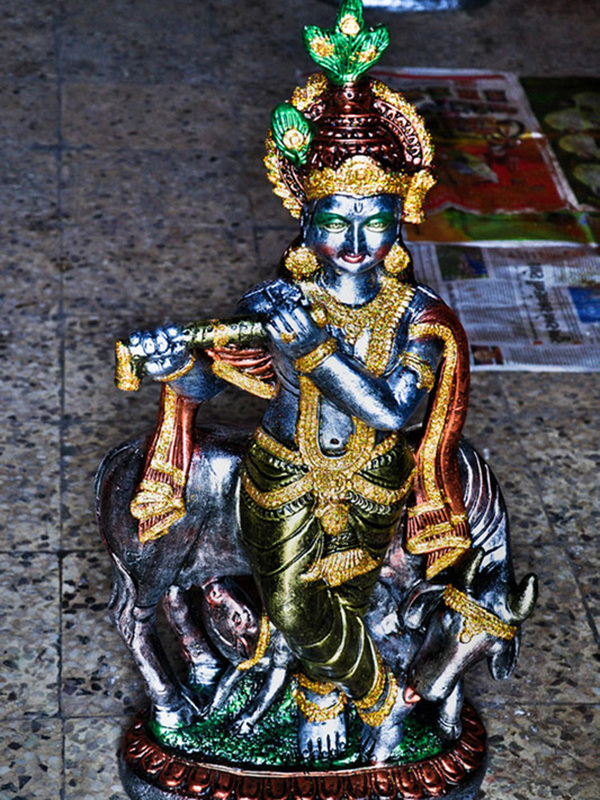 Lord Krishna attractively embellished with gold ornaments used for worshipping. 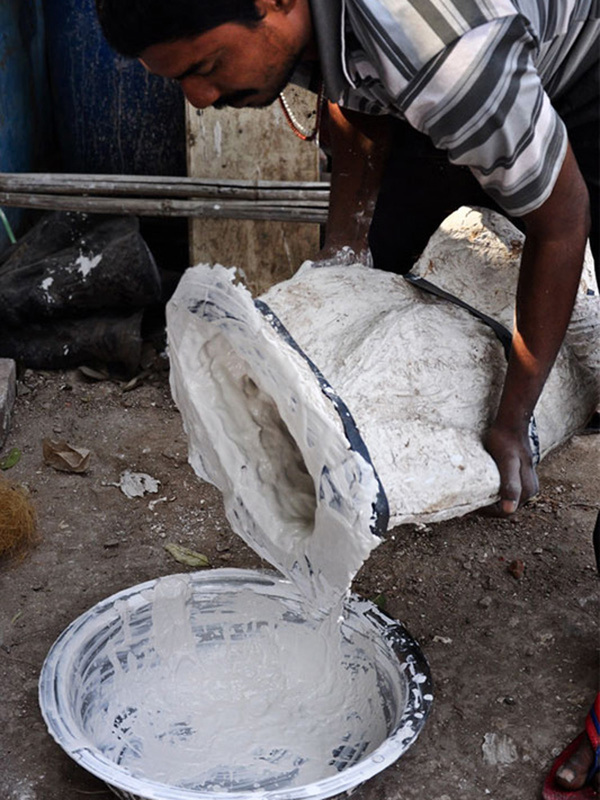 Rubber mold making and PoP molding are the two steps used for making Idol. A masterpiece of the idol is carved and used in the preparation of mold. 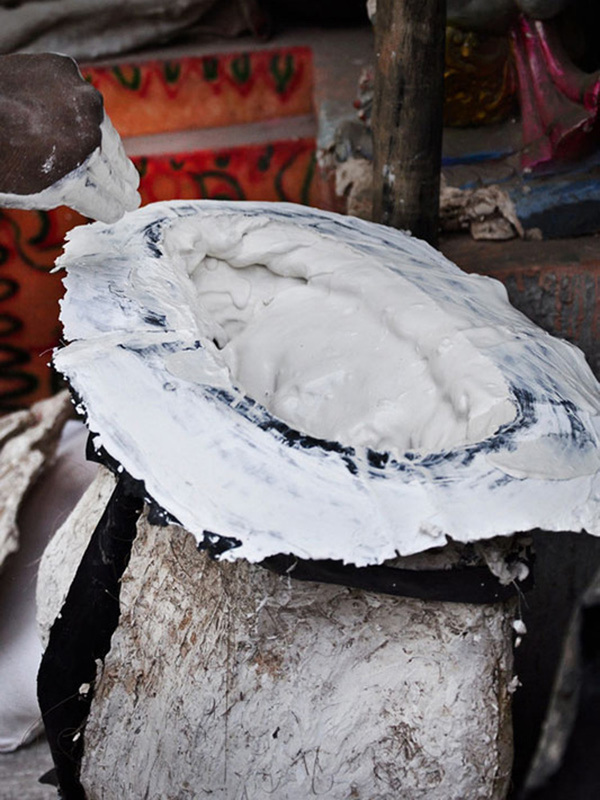 The PoP mixture is poured into the rubber mold and wobbled to spread the PoP paste evenly to the complex contours and the extra paste is removed. The PoP paste is again poured into mold to blend the mixture thicker. And the PoP chock-full mold is dried under sun light, for about 30 minutes to 1hour approximately. The idol is ejected manually with care. 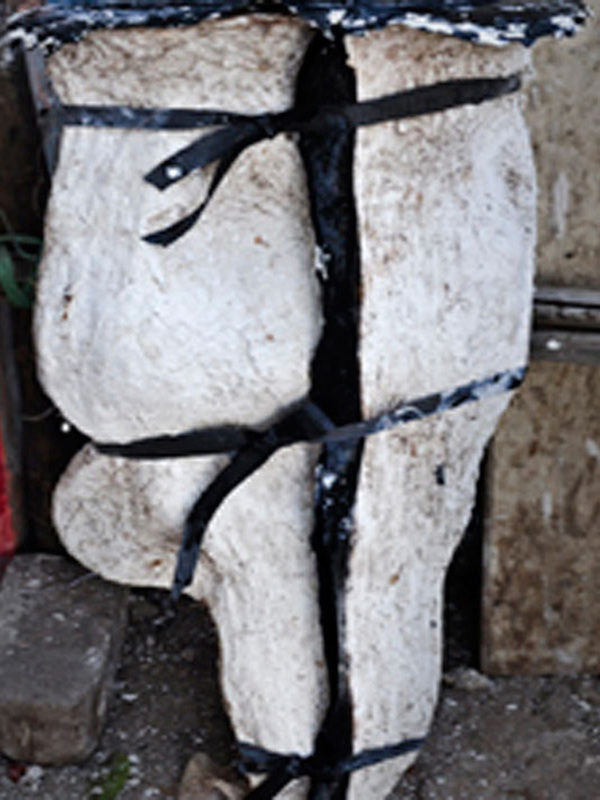 The revealed idol is kept for drying in direct sunlight for 4to 5 hours. 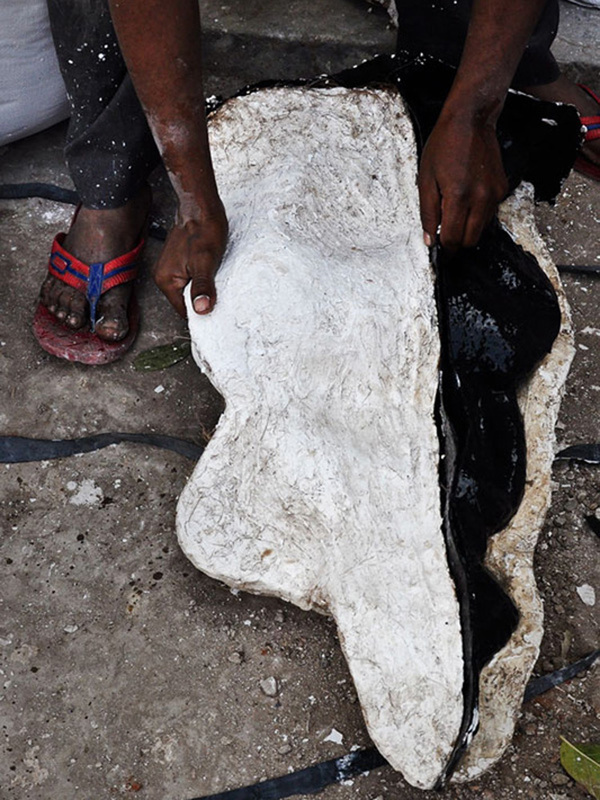 Different body parts of the idol are sculpted using clay and then attached. 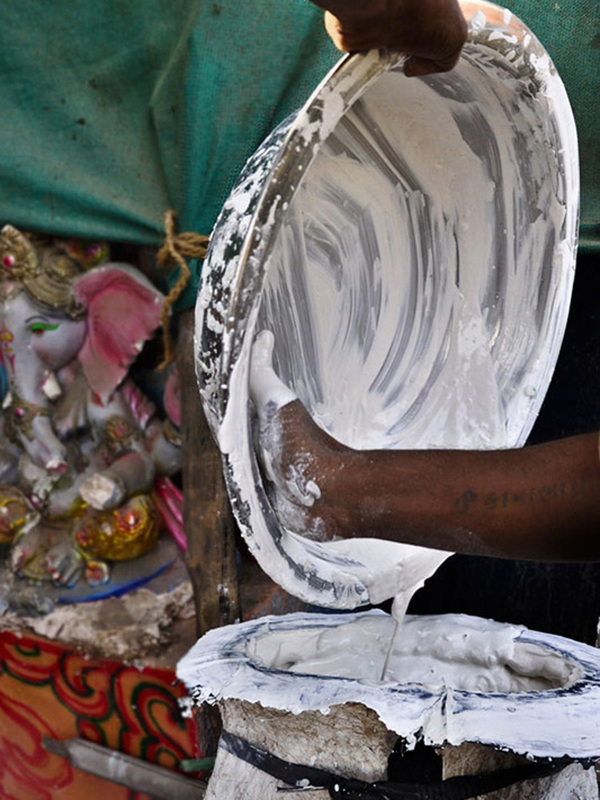 Beautifying the Idol-Sand paper is used for sanding the surface to make smooth. 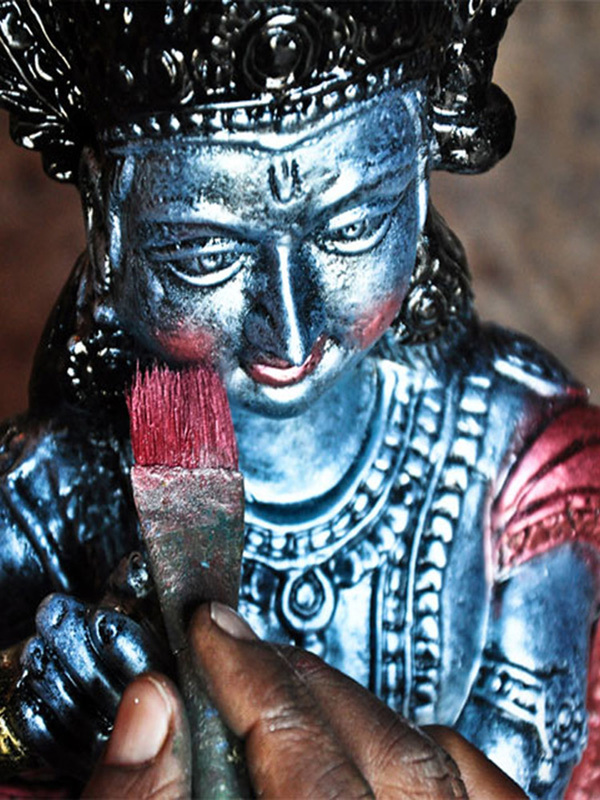 Idol is painted with black color. 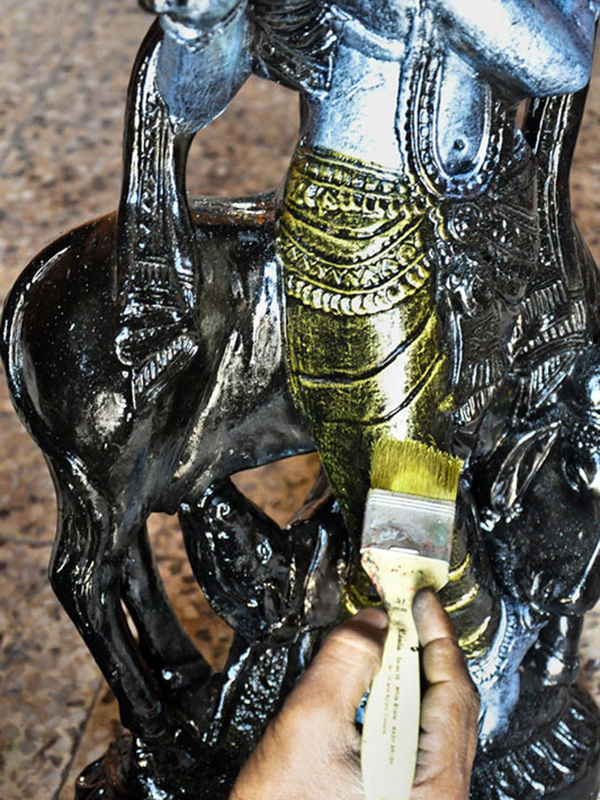 After black color glaze, the idol is blown up with glittering gold, copper, silver and chromatic colors. Painting of Pop idols consists of several steps, which add value.